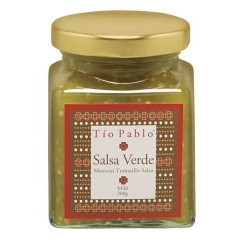 Tio Pablo Mexican Salsa Verde. 200gm. Home > Tio Pablo Mexican Salsa Verde. 200gm. Tomatillos are the key ingredient in much fresh and cooked Mexican food. They are closely related to the tomato, and are also known as husk tomatoes. Salsa Verde is a traditional, green salsa, using tomatillos, coriander, jalapeno peppers, white onion and a splash of lime juice. Made in New Zealand using local and imported ingredients, this mild salsa contains no artificial colours, flavours or preservatives and is gluten/dairy free.